A.C.P. (Automovil Club Peruano) printed on the dial below Omega Speedmaster Professional. CONDITION REPORT: Overall fair condition. The dial luminous material shows signs of aging and has thinned over the years. The dial itself has also some agining over the matte black surface. The seconds hand looks to have been relumed. The case is in good condition and the case-back seahorse is still clearly visible. Notes: In 1964, the Speedmaster had not yet officially become the official chronograph for NASA and therefore was still pursuing the racing and automobile world. The initial purpose of the Speedmaster was as a racing watch with its exterior tachymeter on the bezel. One of these clients was the automobile clue of Peru (Automovil Club Peruano) or A.C.P., which placed an order from Omega for its Speedmaster Professional. According to Moonwatch Only, only 50pcs were ever made and all delivered on July 2, 1964. 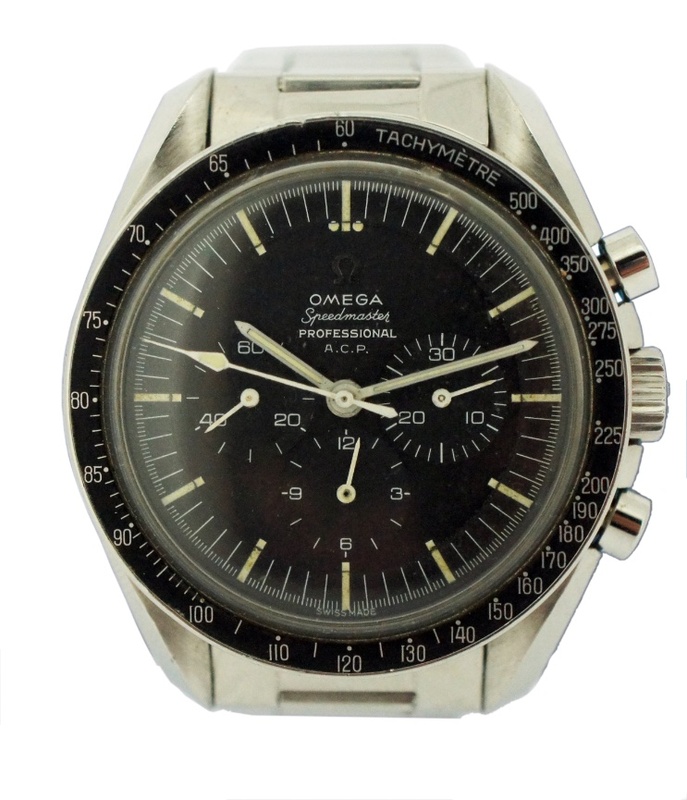 In addition, fewer than 10 examples have been tracked down to date making this one extremely rare Speedmaster.